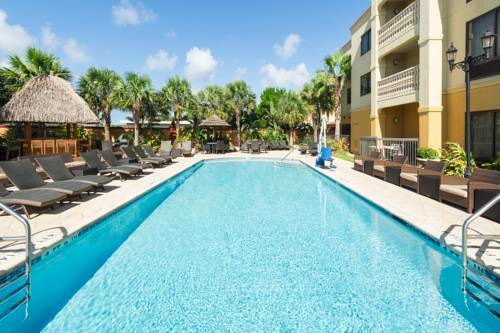 The beautiful Hampton Inn - Suites St. Augustine-Vilano Beach is located in the lazy seaside town of Vilano Beach. Only fifteen minutes from Interstate 95 the hotel is nestled in a laid back residential area on Florida*s First Coast. Visitors coming over the bridge see a spectacular view of the hotel and the ocean beyond. The hotel is convenient to popular attractions like the Castillo De San Marcos National Monument The Fountain of Youth Park The Old Florida Museum and Potter*s Wax Museum. Sitting at the tip of a barrier island the hotel is surrounded by waterways that flow into the Atlantic Ocean and the Intercostals Waterway. They lead into Matanza Bay St. Augustine*s Historic Downtown Waterfront. The Hampton Inn - Suites St. Augustine-Vilano Beach has the charm of a quaint bed and breakfast with most of the amenities included a five-star hotel such as a complimentary On the House hot breakfast free mid-afternoon fresh fruit and popcorn free USA Today free local calls free parking and free pick-up for sightseeing tours. Additional features include an outdoor pool with expanded deck whirlpool fitness center and Suite Shop. All reservations must be guaranteed with a major credit card or advance cash deposit to hotel regardless of time of arrival. ALL RESERVATIONS MUST BE CANCELLED 72HRS HOST TIME UNLESS DEPOSIT REQUIRED. IF THIS RESERVATION HAS BEEN MADE ELECTRONICALLY PLEASE CANCEL IT ELECTRONICALLY TO AVOID CONFUSION AND A NO SHOW BILL. POLICY SUBJECT TO CHANGE. ~2 miles from Vilano Beach. ~35 miles from Vilano Beach. ~66 miles from Vilano Beach.